Honeycombed peanuts a favorite old time especially at Christmas Candy you get 100 pieces. Remember these ? A crunchy peanut shaped hard candy with a crisp shell filled with peanut butter. These were one of my all time favorite candy I ate as a kid, you probably remember eating this too. 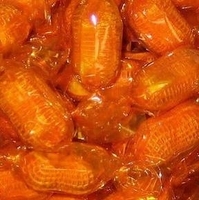 I could always count on my Grandma having these honeycombed peanut candies on her table at Christmas time. Each candy peanut is 1 inch long and individually wrapped. You get a bulk bag approximately 1 pound with 100 honeycombed peanuts. These would make an excellent addition to add with the rest of your old time candy Christmas mix.